Bishop James A. Lewis, Sr. was born the eldest of seven children to Lucy Brown Lewis and David McElroy on August 5th in Georgetown, GA. Dr. Lewis received Christ as his Savior at an early age and was called into the ministry at the young age of eleven. A product of the public school system of Columbus Ga, he attended Cusseta Road Elementary School, Marshall Junior High and Spencer High Schools. Dr. Lewis received his Bachelors Degree from American Baptist College, His Masters of Divinity from Interdenominational Theological Center & Morehouse School of Religion, and his Doctorate Of Ministry from United Theological Seminary located in Dayton, Ohio. Bishop Lewis is a Certified Pastoral Counselor. His Internship for Clinical Pastoral Education was completed at Emory University affiliated Hospitals, which are Emory University Hospital, Emory Clinic, Crawford LongHospital, Wesley Woods Geriatric Center and Egleston Children's Hospital. Dr. Lewis is past Assistant Secretary of the Georgia State Congress for Christian Education and past board member of the Board of the Columbus Convention and Visitors Bureau. He met the former Wilhelmina Bembery in Albany, GA while they were attending Albany State University. 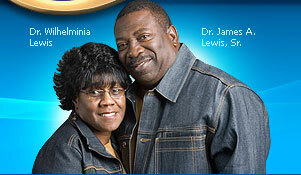 They were married in Leesburg, GA. Dr. Lewis and First Lady Wilhelminia have four children: Elder Kayce Lewis, Rev. James Lewis Jr, (Stephanie), John D. Lewis, and Daphne Lewis. Bishop Lewis is not only a Preacher of the Word of God but more importantly a Teacher of the Word. His books and tapes are used by many to enhance their spiritual growth.